Essential tips, tricks, tweaks and shortcuts to help streamline your day-to-day workflow. Each tutorial takes a hands-on, step-by-step approach with clear screenshots (from both the LCD and the computer environment) and all the MPC project files you need to recreate every tutorial within your MPC as you read along. ‘Sampling Laid Bare’ is fully compatible with both the MPC Ren and MPC Studio. With its intuitive structure and jargon-free approach, this book is ideal for newcomers to the MPC world while also providing the vital information legacy MPC owners need to quickly and effortlessly adapt their existing workflow to the new computer/controller environment. 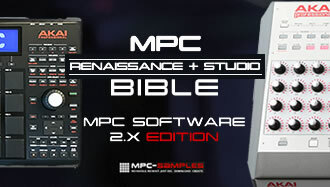 ‘MPC Renaissance & MPC Studio: Sampling Laid Bare’ is the only tutorial book in existence that covers the MPC Ren and MPC Studio, and can be downloaded instantly after purchase. Okay, I am a producer and hiphop artist, and in my current home studio setup I am using multiple DAWs, routing and recording audio/instruments via a standalone mixer to my M-Audio soundcard, and also using a lot of MIDI controllers. But I’m not comfortable with this setup (due to a lot of reasons, especially the workflow, I really dislike “programming” music on a computer), and I’m seriously considering going for the MPC Renaissance the coming month (October). 1. Seeing that The MPC R. relies on the capacity of a PC/Mac, what’s the preferable system requirements in 2013? Right now I have a laptop (Win8) with i7-CPU, 16GB of RAM and 500 GB HDD. I also have additional USB HDDs. Is this oomph enough to make the MPC R run smoothly? And which DAW would you recommend for the best compatibily? I’m using Cubase and Sonar X2 as my DAWs. I see Young Guru is using Ab Live a lot. 2. Do I really need a soundcard if I have the MPC R? Can I use the MPC R’s built-in soundcard with my DAWs, for proper recording and mixing? How do I assign the ins/outs within the DAW? Will Ren show up under inputs? If NOT, which soundcard (USB) do you recommend? 3. Can I finally discard my old 24 track Behringer mixer, and route my input instruments (synths, mic, etc) through the Ren? 4. A future article that focuses on studio setups, routing and integrating the MPC with the computer, DAW and the rest of the control room would be truly appreciated. I’m looking for a functional setup that runs smoothly, and I was hoping that you could help me out a bit here. I’m pretty sure I’ll visit this site quite frequently in the coming time for more useful information, and the Sampling: Laid Bare book is already on my list of must-haves! Your existing set up should be fine, no need to change computer, no need to change DAW. You can use the Ren soundcard, just like any other USB audio interface. It’s decent enough, has phantom power etc, but isn’t really a replacement for dedicated multiple input/output interface (it only has two analogue inputs for example), plus the Ren soundcard only ‘works’ if the Ren is switched on, so makes for a very cumbersome interface. Vintage mode is optional BTW. If you are intent on the MPC route, also consider the option of an MPC Studio and then get a separate audio interface to your exact requirements. And don’t forget to check out other options such as Maschine, Push etc. Go for whichever one suits your workflow.